Why can’t we celebrate and share love everyday? I know folks who did. For each other, for their children, for friends and family, and for people they’d never even met. They lived out a great love story. Theirs was a story of wrinkled noses saying, “I love you.” One hand reaching and the other hand finding. It was of rides on backroads together just to see what was down them. Lunches at restaurants they’d never heard of. It was once a week at the pizza buffet with their grandchildren. It was a love story of quiet moments and loud laughter. One of choosing the perfect book together for a child they loved. Theirs was one of working computer puzzles together and watching TV just before bed. They gave quietly and freely and loved without boundaries. She wrote and illustrated, and he cheered her on. He designed and built with wood, and she did the trim and accessories. He pulled down things from up high and opened jars, and she cooked his favorites and mended his jeans. They were each other’s best friend and somehow they made it through ups, downs, highs, lows, and all the day-to-day stuff in between. There was a time their relationship frustrated and confused me. When Aub and I were living there with them, one night I was in the den and Daddy was sitting at his place at the table, having his “bednight snack” of peanut butter and crackers. He’d finished a sleeve of crackers and just closed the jar of peanut butter, as he read the paper. Mama came walking through on her way to the laundry room after her shower. Without looking up from his paper, hearing her footsteps, he held out the jar. Without missing a step she took it and put it back in the kitchen as she continued on her way. When I said something to them, calling them on it, they just shook their heads. I don’t even think they were conscious of the motions they made. I was blown away. That whole interaction has stayed in my mind for all these years. And lately as I’ve played it over and over again, I realize that it was not a reflection on either of them individually. It was who they were together–in sync. Neither had to think it through. Neither thought anything about loving and serving each other. It was a mutual relationship. Each one did what he or she could for the other. And it worked. Because that is what love looks like. Doing what we can for someone else. Without stopping to assess what it will do for us. Recently my sisters and I took on the task of going through Mama’s things in her room. Yes, it had been almost a year. Grief doesn’t have an instruction manual, and you just have to do things when you are able. That time had come for us. As we went through the closet and then the drawers, we laughed, we remembered, and we made the best of something so very hard. It was in one of her drawers that I found the folded up papers. As I pulled the pages out, I glanced and saw my Daddy’s handwriting. I remembered my Aunt telling me that Mama had mentioned to her that Daddy had written her something very special, words between a husband and a wife, a man and a woman, words that she loved and treasured. But my Aunt couldn’t be sure if Mama still had them. The letter from Bill to Barbara. Written on her 29th birthday. Tucked away safely in the back of a drawer. Same way I do. I keep finding out more and more how much alike we are. Were. Are. I put them away to ponder over what to do with them later on. Settled. I talked it over with my siblings, and they agreed. We would let the letter stay between them. 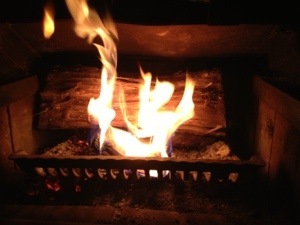 It was on New Year’s Day that Mess Cat and I carefully put the letter in her woodburning stove and let the words go. The loving and tender and cherished words. Ashes to ashes. 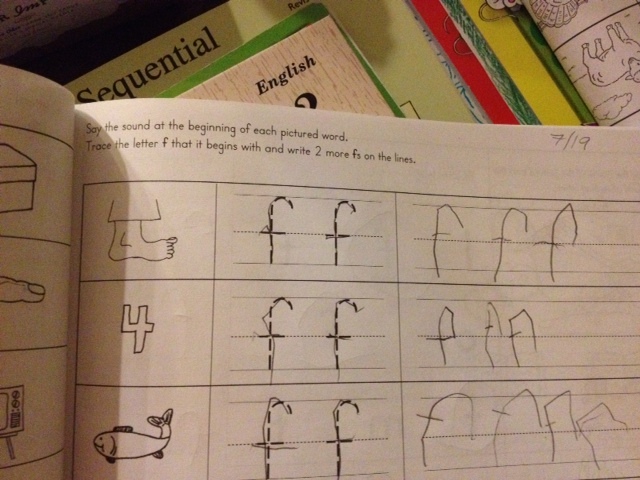 It was four pages, written by hand with a pencil. From my quick glimpse I did know that he wrote it while she was sleeping. 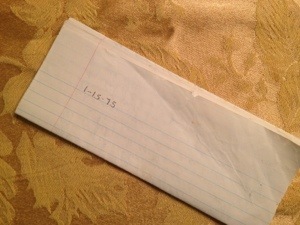 Mama had written the date on the outside. 1-15-75. Her 29th birthday. They had three girls under the age of six, and had suffered through at least one miscarriage. This was less than one month after they celebrated their seventh anniversary. A love letter. About what he loved and treasured about her. It’s all I know about his words, but it’s enough. Hallmark can’t even begin to touch that. That my Mama saved this letter, all those years. That my Daddy, who loved quietly and deeply, sat down and wrote them. I can hardly fathom it. That’s a strong love. A love bigger than just one day. It was a love made to last the over 16,000 days they spent together on this earth as husband and wife. That’s over 384,000 hours and over 23,040,000 minutes–all of that time choosing to love. Choosing a kind word over harsh ones. Mama and Daddy weren’t perfect, and I won’t say I didn’t hear the door slam that one time, but they chose to love. Even when things weren’t perfect. Especially then. I never heard either one of them say anything unkind or harsh about the other one. In all the days I can remember, they were a team. When Daddy was so sick and tired and worn out, his only worry was Mama and how she would manage. And after he was gone, Mama honored his life by trying to put hers back together. Trying to do the things that would honor the life of the man she loved with all of her being. The man who wrote his love a letter when he was almost thirty-two. A letter of a lifetime. As the flames twisted and turned the pages and swallowed up the words of love, I felt a special warmth from the flame. And in my head I heard my Mama whisper, “Thank you baby girl.” Theirs was a love so special, so precious, and while we were fortunate to be the beneficiaries and witness to this love, it was between them. And so it should stay. I want my children to learn to love like that. I want each one of them to find the person who feeds their soul, with whom each feels balanced and treasured and respected–the one they call their best friend. I want them to trust and to defend and to honor and to share, just as my parents did. I want their homes to be filled with the simple joys that money cannot buy–the laughter, sharing stories, sitting down to a home-cooked meal together. I want my daughters and my son to love someone so much they simply must put it into words, writing all the wonderful and beautiful thoughts and feelings down. And I want them to be loved so dearly by that one special person that when they leave this world, there is a letter tucked in the back of their drawer, folded and hidden away. Yellowed with age and worn with the wear of being read over and over through the years. A love so great it pours into all the other days of the year…..a love so special it’s for the everyday. It’s been a long decade so far. I’m in dire need of change. For the better this time. Please. The past three years have been filled with a lot of sadness and heartbreak and caregiving and tender, sacred moments. I’m not saying I’ve had any more to deal with than anyone else, but, not for nothin’ y’all, I’m tired. I need a little pick me up. As time winds down to the day that my oldest heads out on the next leg of her life journey, I find myself in need of something to care for, to cuddle, to sit next to when I’m reading. And y’all, Cooter, my baby, is six and it’s just not his thing anymore. I want me a puppy. I grew up with dogs and puppies. My great-grandparents were known in the area for the rat terriers they raised. My Granny also bred dogs. Her Bassett puppies were so adorable, I still melt when I think of them. It’s in the family. 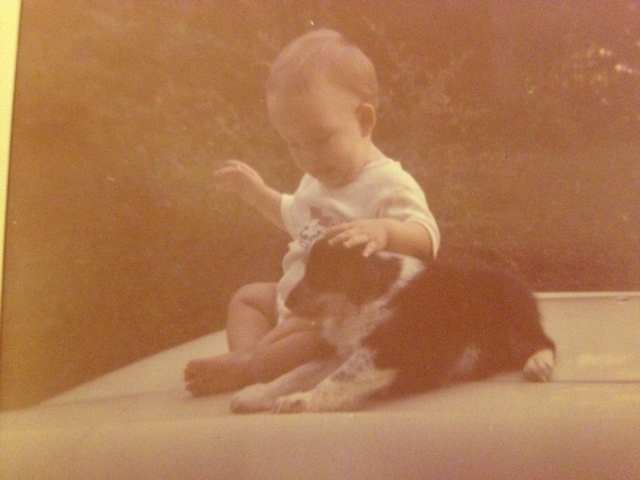 My first dog was Pete. We had him when it was just me and Mama and Daddy and we lived in Meriwether County. He was a beautiful dog. Later on we had Blue. He was a little smaller but had a great big heart. 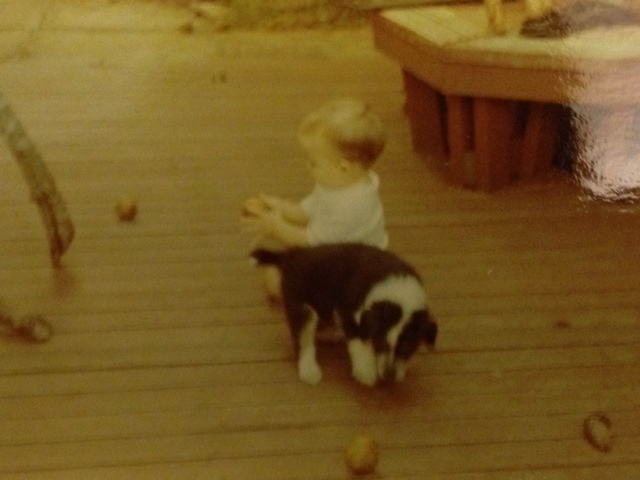 A few years later, Daddy was working on a farm near my Granny’s, and one day a dog showed up. Daddy took a liking to him and brought him home for us. He was named Slocum, because I told Daddy he was slow to come when I called him. But he was the greatest dance partner EVER. Over the years there were many other dogs. Shadow and Sugarfoot came along when Mama took us to go get a new puppy. Mama and my sister loved Sugarfoot and I loved Shadow. The folks giving them away offered Mama a big bag of food if she took both. I’ve already said how much Mama loved her a bargain, so yes, both of those little loves came home with us. We also had Belle the Bassett, and Samantha the German Shepherd. Samantha just showed up one day at our first house in Byron. She attached immediately. I remember one day a mean stray showed up when I went to check the mail. That dog barked and growled at me. Samantha walked sideways and pushed me all the way back to my front door, barking and protecting me the whole time. A special one that one. When I graduated from college, I got myself a puppy that was 1/2 Bassett, 1/4 Fiest, and 1/4 Chihuahua. So sweet. Her name was Madge. She was my little lady. Until she got aggravated and scrunched that cute little face up at you. 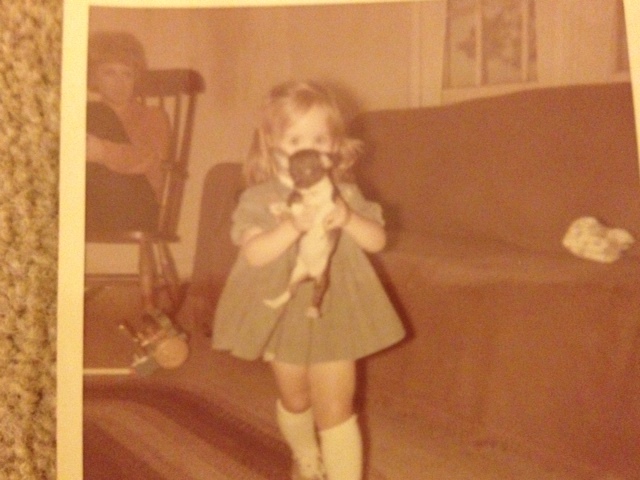 In my previous life I was part of the family with Millie, a Boston Terrier. Smartest dog I’ve ever known. You could ask her if she was hungry or thirsty or wanted candy. And depending on what she wanted, she’d either be still or start bouncing on her back legs. She knew what you were asking. She also became very defensive of me, which I really appreciated. 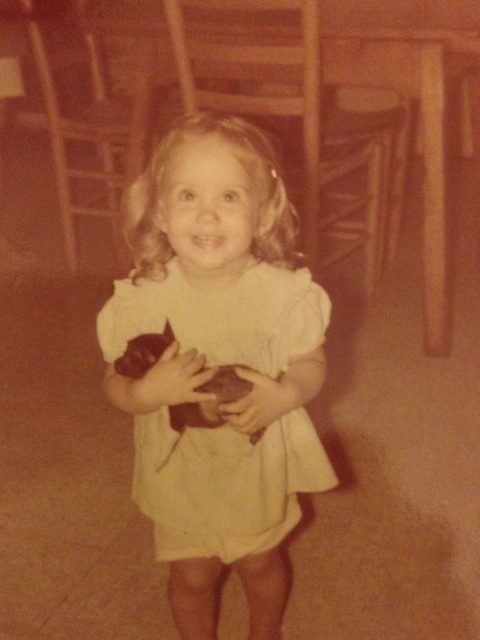 Then there were Scarlett, Rhett, Prissy, and Pittypat, the Beagles–my attempt to join the ranks of the breeders in my family. It might have gone well if I hadn’t had to move back home. But that’s another story. When my girl and I ventured out on our own we added Bosley and LizzieLou Ashalee to our family. They were both sweet dogs and brought us comfort and protection and companionship. Years later after our family returned from Japan and we settled into our own home, we added sweet Tater, the Golden Lab/Bassett mix we adopted. He was a sweet dog, but he just got wanderlust and started digging out. This started right after the boxers next door started digging out. I swanee those dogs whispered their secrets to him under the fence. *sigh* Anyway, we were lucky to find a farm to take him in where he could roam and roam and live with a beautiful American bulldog buddy. And so here we are now. Dog-less. Because of allergies we are downsizing our cats to only the outdoor ones. And I’m sad. I want me a puppy. A hypoallergenic, indoor, follow me around and remind me of the fun in life, genuine puppy. I used to say it was hard to sit on your pity pot when you had a little one sitting in your lap. Now that my littles have just about outgrown the lap-sitting phase, I’m going to modify that statement: It’s hard to sit on your pity pot when you have a dog looking in your eye and licking your face. I just know it would be. The crew and I have talked about it. I told them we’d name her “Miss Kay” when we get her. (Note the positive thinking use of “when.”) I’ve mentioned this want (dare I say need?) to some of my friends. One sweet friend said she wanted to go with me when I get my puppy. Another suggested maybe I should get a rutabaga instead. That tickled my funnybone. I think that might just be a good name for my new little one. Aub says we could call her “Rudy” for short. I like it. And so the decision-making and discussion continues. I think back over the years and dogs that my parents let us have. What I appreciate so much now that I’m grown is that they let us get those dogs, despite being pretty sure of how it would turn out. That they would wind up taking care of the dog, that hearts would be broken eventually, that ultimately one of the dogs would tear up or chew up something. It’s just the nature of the animals–both the children and the dogs. And yet, they still said yes. More times than not. As I do my research on breeds (Yorkie or Morkie) and remember all that having a puppy again would require, I know there are downsides to the warm and fuzzies. I have had my share of piddle puddles and getting up at 3 a.m. to housebreak a puppy and heartworm treatments and losing a puppy to parvo or a dog to an automobile. It’s hard stuff. But in the end, for me, the warm and fuzzies win out. 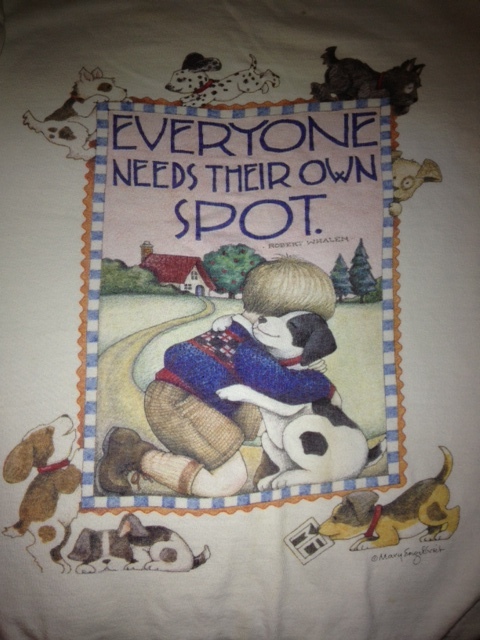 Years and years ago, I gave my Granny a print by Mary Engelbreit which had a quote by Robert Whalen on it. She and I both loved it so much that when I found the art on a t-shirt I got it. 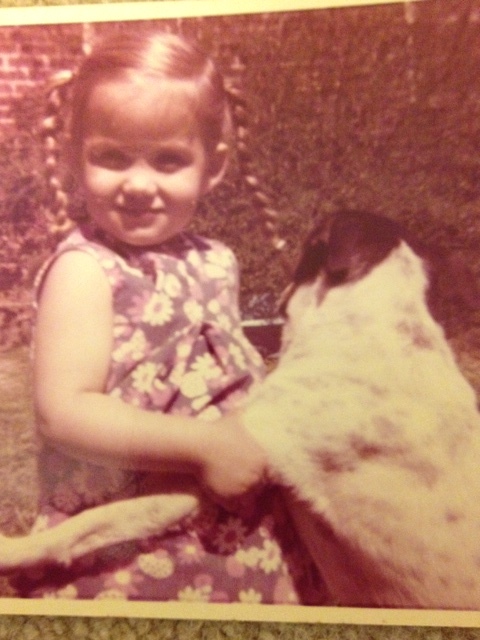 It reminds me of two parts of my life that made me very happy–my Granny and my puppies. As the winds of change come sweeping down the plain, I find myself more and more certain that, while a puppy might not fix everything, it would come mighty, mighty close. Yep, I’m thinking Imma need me that puppy.